In an uncertain future something has gone wrong and zombies are filling the streets of your city. Luckily, you recently bought a 3D printer toaster and you have hacked it with a killer firmware (with your mad science skills) that will save the whole city shooting pairs of toasts like crazy! PC controls: Arrows for moving + WASD (or ZQSD if you are AZERTY) for aiming. Mobile controls: Touch in the direction where you want to go and the toasts will be aimed in the last direction you moved. 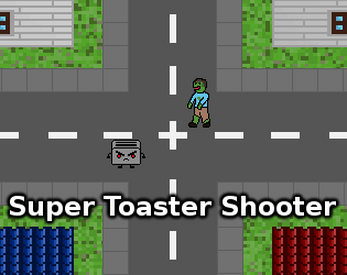 This game is part of the #js48 game jam and was made with Phaser. Hi all. Can you please fill out this form for me to get back to you about prizes!